Lindsey, they are so adorable!!! Seriously, I'm going through Sadie with drawls. When your parents leave, I get to kidnap her again!!!! You should take some pics with Maddie and that adorable bow for the announcements. I love it!!!! What a great picture! They look like they'll be best friends in no time! How did you get them both to look? Teach me! Way cute. Susan, Blake took the picture. I have yet to be successful in taking a picture of the both of them...let alone a picture of Madison with her eyes open! This is the most adorable picture! Madison looks like she is still trying to figure out what is going on. She is so beautiful! 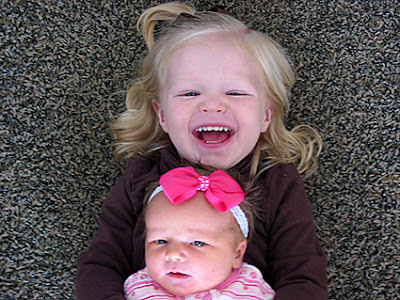 And Sadie looks like such a GREAT big sister!